The occasion was the start of a candlelight march on the evening of Monday, Aug. 28, in response to recent bias incidents, locally and nationally. Copley and Rabbi David Holtz of Temple Beth Abraham led the mile-long procession, which attracted hundreds of Christians and Jews. The idea for the march was conceived by Kimberly Marcus and Anita Marshall, who belong to Temple Beth Abraham. Earlier this year, after a rash of bias incidents, including a bomb threat to a Jewish Community Center in Tarrytown, the temple hosted an Interfaith Passover Seder that parishioners of four Tarrytown churches attended. The purpose of the Seder was “to build relationships, for good times and bad,” Holtz said at that event. The march ended at Patriots Park, where Copley and Holtz stood on a small stage that musicians use during the weekly farmers’ market. 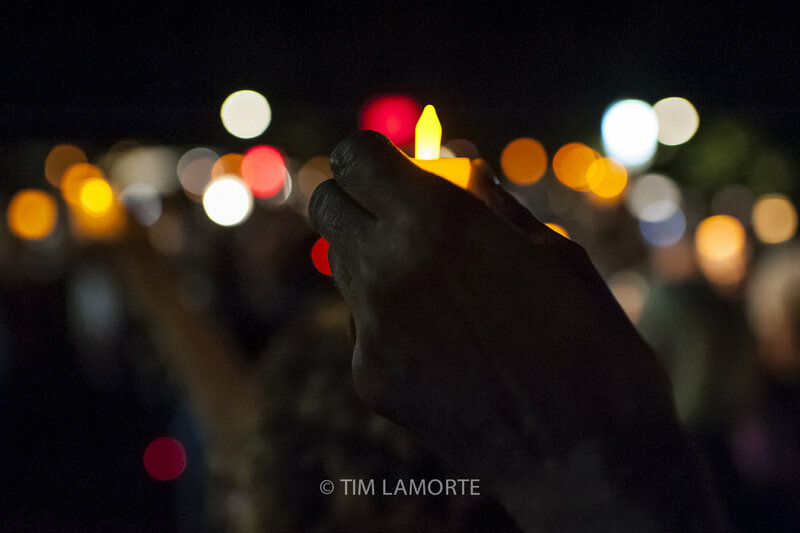 The marchers gathered around them, some holding candles and others holding smartphones equipped with candle apps. There was singing and there were speeches. Holtz praised the crowd for coming together “united by the idea that hate will not be accepted, that we will not be afraid, that we will defend one another, and that we will stand up for each other.” Both he and Copley also challenged those before them.